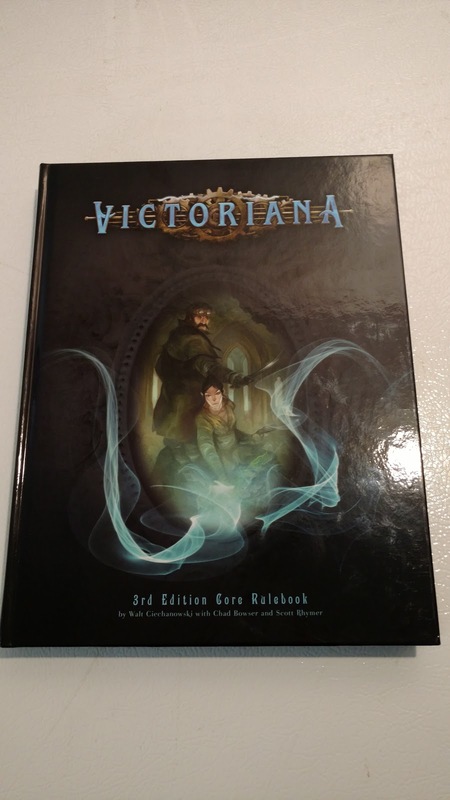 While Victoriana 1st edition first caught my attention and 2nd edition became a favorite, it is 3rd edition that might be the best version of the Victoriana game. My deepest apologies to all the people that worked on the first two editions, some who I now consider friends. Full Disclosure: I bought my own hardcover and pdf copies of these books. While I consider many of the fine folks at C7 to be friends, they did not solicit or expect a review. Victoriana 3rd Edition uses the same system that powered Victoriana 2nd edition, but cleans up the game and gives it some new life. Led by Walt Ciechanowski, Victoriana 3 became something a little different than before, but uniquely more "itself". You can use all the supplements, adventures and characters in 3rd edition that you did with 2nd edition with now issues. 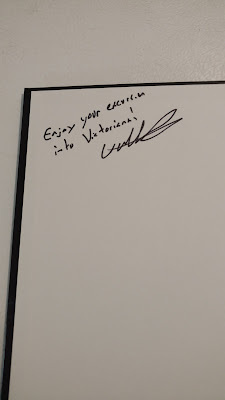 Vic 2nd edition has a conversion guide to 1st in case you need that. There are sidebars to let you know where the major differences are between 3rd and 2nd edition. There are even a couple of places where specific 2nd Edition books are mentioned. Now set in 1856 (ten years earlier) we get a different feel for the age. 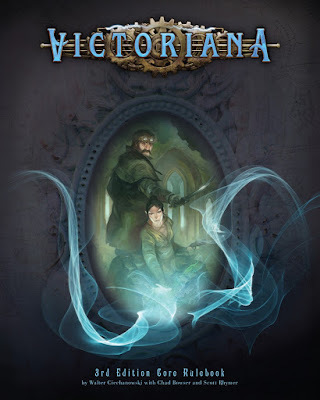 The world of Victoriana 3 is a little darker, a little more dangerous and a lot bigger. So if you are using any of the supplements, such as the India one, you will need to adjust some events and tone, but not mechanics. There are also sidebars that mention the differences between Victoriana world and the real world. For example the Bolshivik revolution is getting started earlier here and Charales Darwin is now a "Dr." (he "only" had a Master's degree in real life). This version of Victoriana puts more emphasis on technology. It is fantasy tech and steampunk tech, but there is more of it. Not to say magic has taken a backseat here, but it is not as prevalent in the writing as it was before. Also, the gothic horror elements have been turned up a bit in this as well. Magic, when it is there, is scary. Victoriana (any version, but especially this one) is the game where you can take anything from any other Victorian-era game, use it here and it works. Eldritch horrors from Cthulhu by Gaslight? yup. Investigations from Baker Street? of course. Superhumanity from Victorious? Sure, why not! In fact, this kitchen sink mentality works really well in Victoriana. The system is the same. You get a dice pool of s6s. Roll them, explode the "6"s, count the successes. If you have enough great. The rules in this version read better. I mentioned in my review of 2nd edition that the only way to truly review a game is not just to read it but to play it. 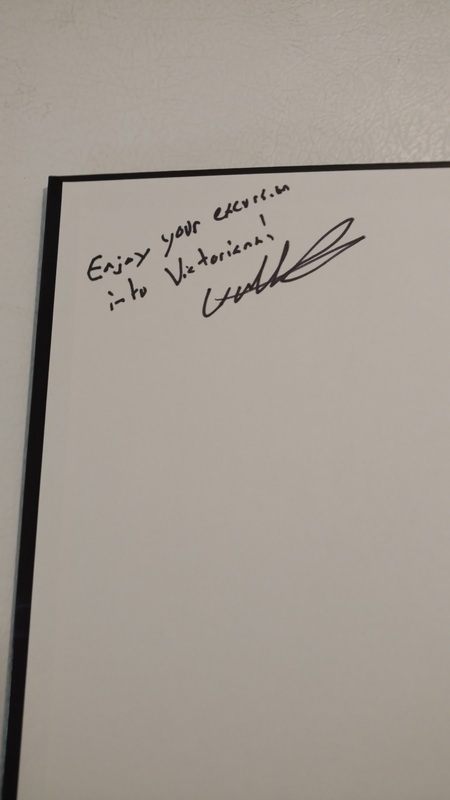 I have played Victoriana now for almost 10 years. Despite that, and even more years of World of Darkness and ShadowRun, I am not a fan of dice-pool games. I have tried play Victoriana using the Ghosts of Albion system. It worked, and it was fun. But it wasn't Victoriana anymore. The Heresy game system is very much a part of what makes this game what it is. Much like the Basic Roleplaying System works for Call of Cthulhu and d20 for D&D, this system imparts a feel to Victoriana. The black dice, the exploding 6s, all of it is part and parcel of the game experience. Character creation is a bit easier, or at least a bit more guided in this version. Emphasis is not placed more on social class than whether or not you are an orc, Eldren or human. By the way, the Eldren (Elves) in this version get really strange. You can be an elf, but be prepared to have some weird quirks or even some mental illness. Personally, I loved this idea and would like to try it in other games where I have elves/Eldren. Really, it is that cool. There are some changes to gnomes and Huldufolk (halflings) that make them more different than each other and more interesting. Nocturnal academics vs. rustics with a keen interest in one area. Note: This would be a great template on how to bring Castles & Crusades elves, gnomes, and halflings into a Victorious game. The book is huge at 320 pages. Again the cover is color and interior is black and white. And again this is how it should be. The hardcover is sturdy and looks great. The PDF is bookmarked. While I loved the mix of art in 2nd edition, the art in 3rd edition is more consistent. The character sheet from 3rd edition is one of my favorites. It just looks so cool. A color option though would have also been nice for those special characters. The rules include a great collection of items from the age and various forms of entertainment. There are also clarified rules on various chases (coach, boat, airships) and the effects of drinking and drugs. Victoriana is one of the games with a quiet, but steady and dedicated following. The fact that the games are always sold out in minutes at Gen Con is a testament. For me, I will say this. If there is anything you have ever wanted to do in a Victorian-era game then Victoriana has a way for you to do it.